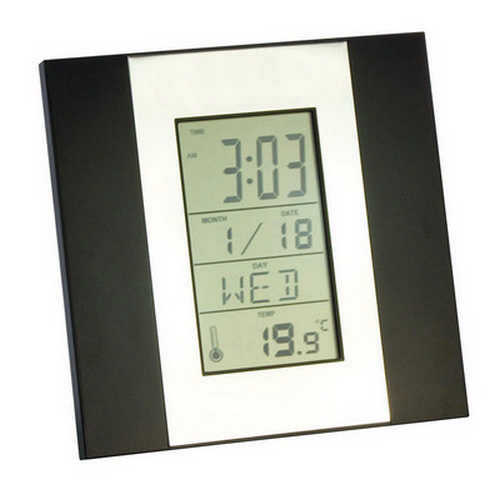 Multifunction LCD clock. Metal chrome plated front. Perpetual calendar snooze alarm clock. 12/24hr time display. Indoor thermometer temp display. AAA batteries included. Gift boxed. Product Size: 130 x 130 x 20mm. Product Packing: Boxed. Decoration Size: 40 x 13mm. Decoration Position: Front. Decoration Method: Pad Print. Carton Quantities: 40. Carton Size: 30 x 29 x 29. Carton Weight: 8. Colour: Silver/Black. Price includes : Pad Print 1 Colour / 1 Position. Setup is included.